In the second book of the series, Percy is getting comfortable in his role as one of the half-bloods and excited about going back to camp for more training. But as normal, the mosters that seek after the children of the Gods cause problems and another adventure is started. 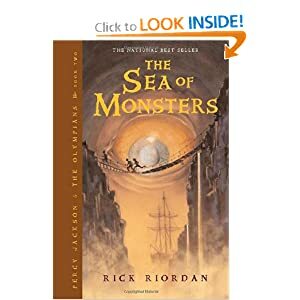 There is a new character added to this story, so the group of three: Annabeth, daughter of Athena, Grover, a Satyr searching for the missing God Pan, and Percy are joined by another reoccurring character Tyson. While the new character is a friend of Percy, Tyson does create some internal struggle and brings up the problem of the Gods as absent parents. Like a lot of children’s books, the parents in this series are longed for, but usually out of the picture. Even the adult protectors have been fired and that leaves it up to the kids to save the day. The pacing and action are still very good in this book and I blew through it on a plane ride. On to book 3.